As the newest member of ATI’s Field Services team, I’ve discovered that “It takes a village to raise a child” doesn’t apply exclusively to raising children. The team members from all departments, I have discovered, are truly committed to creating a village here at ATI to help Galileo users at all levels – clients, students, parents and co-workers. The scope of knowledge and expertise that I’ve encountered as I train to represent ATI to districts and charter school organizations is impressive, from the members of the Educational Management team, to the Professional Development and Field Services department members. I have been invited to participate in trainings, sales presentations, webinars and conferences. Without exception, every individual has been happy to help me understand the huge body of information available about education, assessments, psychometrics, instructional effectiveness and the entire Galileo Online system. These professionals are truly committed to ensuring that we all have access to the information and expertise to help us raise this and future generations, to help them all achieve at higher and higher levels, so they too, can continue to raise their children in a global village. I want to take this opportunity to address some questions that have come up regarding readability metrics related to the texts appearing in Galileo K-12 Online assessments. One of the interesting aspects of readability metrics is the attempt to quantify, mathematically, the literary and informational expression found in text. These measures provide a handy guideline for determining if the structural complexity of a text is relevant to typical readers at a grade level. However, there are some limitations to the numerical categorization of text, which will be covered in this blog post. First, it’s important to address the purpose of testing students using text-based items. The ATI Assessment and Instructional Design team’s goal in developing the texts and items is to provide a basis for clear measurement of students’ abilities to comprehend and analyze text in a way that informs educators on each individual student’s progress toward standards mastery. To make sure that all students being assessed are challenged, the most effective strategy is to include texts and items of variable difficulty. This means that some items are achievable by all students, some by most students, and some only by students who are proficient in the expectations required to complete those tasks. Note that Common Core State Standards information recommends a broad text readability range in measuring performance on Common Core State Standards-aligned assessments. All texts used in Galileo Online since 2002 have been analyzed using the Flesch-Kincaid Readability measure. A Flesch-Kincaid score can be calculated manually or by utilizing the Microsoft Word Spelling and Grammar tool with the Readability option enabled to get the score. As can be seen in the formula, the number of syllables/words and words/sentences in an analyzed text are the key determiners of the grade level rating of a text. Below is an example of the paragraph above, analyzed using Flesch-Kincaid, and then revised using an understanding of the nature of the formula. As can be seen from the three examples above, the readability number, while useful, is simply an analysis of the structure of the passage, not the appropriateness of content. Edits made the text simpler for less-accomplished readers because they are more familiar with simpler sentences and words, but did not simplify the topic. Sometimes compound sentences and polysyllabic words are unavoidable, even at earlier grades. The presence of these complex sentences and more difficult words will affect the readability statistics of the text, but may or may not affect the students’ ability to comprehend the text. For example, longer words that the students are familiar with will not make the text more difficult to read even though the readability formula will interpret them that way. Awareness of these limitations makes this quantitative measure simply a guideline to avoid overly complex sentence structures and longer, unfamiliar words. One question that is often asked is the meaning of the decimal points. A text with a score of 4.4 is not intended to be aligned to the fourth month of fourth grade, but simply to be structurally more complex than a text with a score of 4.2. There is no direct correspondence between a specific Lexile measure and a specific grade level. Within any classroom or grade, there will be a range of readers and a range of reading materials. For example, in a fifth-grade classroom there will be some readers who are ahead of the typical reader (about 250L above) and some readers who are behind the typical reader (about 250L below). To say that some books are "just right" for fifth graders assumes that all fifth graders are reading at the same level. The Lexile® Framework for Reading is intended to match readers with texts at whatever level the reader is reading. We all recognize that the quantitative structural scores of text are just one aspect of readability. The other aspect is the qualitative element of the topic and ideas presented therein. ATI’s content specialists and each district’s teachers choose topics and themes that are meaningful to the students. We encourage all of our district partners to engage in the assessment review process, which allows the replacement of items and texts to better serve the needs of each district’s students. ATI develops items aligned to texts to serve a broad range of student abilities, and is glad to work with our partners to make sure that the texts presented in the final version of custom assessments have the support of the educators who will use them to inform instruction. Further questions on readability and text appropriateness? Please comment below. Technology has an ever present and evolving place in modern life. The expectations for technological competency are increasing steadily for adults and children alike. Children as young as elementary school age are being expected to use technology to complete assignments and assessments. Prior to entering kindergarten, children should have some basic experience using technological devices. Some children may be exposed to these devices at home but for others, learning opportunities presented in preschool may be their only exposure to technology. The Galileo G3 Technology Scale, released in the spring of 2013, was created in response to the needs of programs to track children’s progress towards technological competency. ATI's early learning experts designed the Galileo G3 Technology Scale by consulting the most current research in preschoolers' use of technology and various state early learning standards for technology. This approach provides an assessment scale which offers comprehensive coverage of state standards for technology while supporting teachers in their provision of developmentally appropriate learning opportunities for children. For more information about using the Galileo G3 Technology Scale, contact the ATI Pre-K Field Services Team at 800.367.4762. 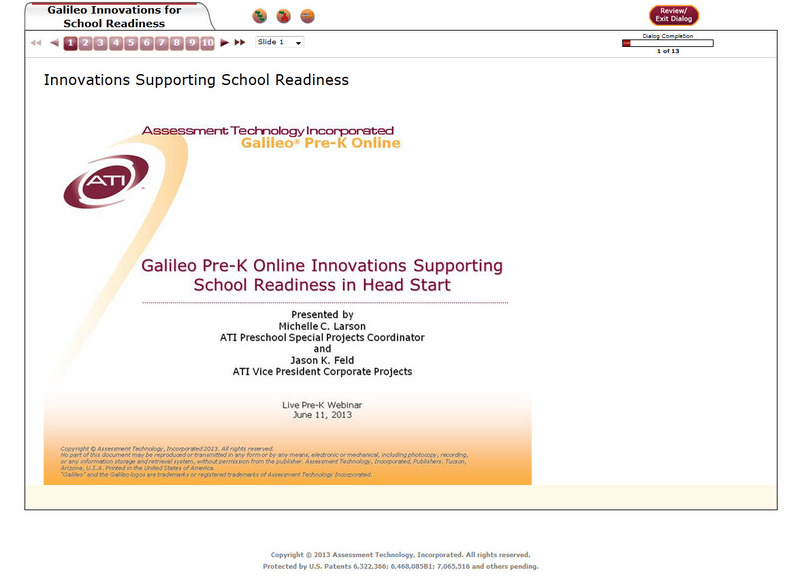 Thank you to all who participated in the ATI-hosted webinar, Galileo Innovations for Common Core Implementation. If you missed it, or to watch again, the webinar recording link is provided below. The webinar provided an overview of the current and upcoming innovations in Galileo K-12 Online designed to facilitate local assessment and curriculum implementation of Common Core State Standards (CCSS) in districts and charters. Galileo K-12 Online continues to evolve in response to client needs, changing federal and state requirements, ongoing research in educational assessment and instruction, and advances in technology. A major area of ongoing Galileo innovation is focused on CCSS and on supporting CCSS implementation. Mark your calendars to attend the Arizona complimentary seminar: Building a Successful Local Educator Effectiveness Initiative with Technology and Research. Co-hosted by Creighton School District and ATI and will include a panel comprised of leadership staff from several Arizona districts and charters, December 3 at 8:30 a.m. MST. This seminar will focus on how Arizona districts and charters are using technology and research to address current and future challenges related to implementation of local educator effectiveness initiatives. The seminar will feature a panel discussion where panelists will share their challenges, solutions, and the next steps for moving forward. There will also be a discussion of measuring educator effectiveness with the Arizona College and Career Ready Standards and an overview of Galileo educator effectiveness technology. We are happy to announce that the Massachusetts Department of Elementary and Secondary Education (ESE), in partnership with WestEd, identified Galileo K-12 Online assessments as appropriate for use as District-Determined Measures (DDMs). Read alignment specifications of Galileo assessments to the ESE criteria. ESE states on its website that assessments selected as DDMs by WestEd are aligned with critical content identified in the Core Course Objectives and/or the appropriate Massachusetts Curriculum Framework1. A key criterion of the Commonwealth's new educator evaluation system, DDMs provide districts an opportunity to broaden the range of knowledge and skills they assess and how they assess learning. Districts must identify or develop measures for assessing student learning for each educator evaluation. Educators in Massachusetts, and nationwide, will need data from several measures of student learning in order to identify trends, patterns, and academic achievement under new educator evaluation initiatives. Galileo technology, in use by a diverse and growing number of districts and charter schools, provides educators the student growth data to address these requirements in preschool through high school. Attend the Galileo Innovations for Common Core Implementation webinar and learn how the current and upcoming innovations in Galileo K-12 Online are designed to facilitate local assessment and curriculum implementation of Common Core State Standards (CCSS) in districts and charters. Common Core Assessment Innovations – View examples of Galileo item types aligned with CCSS and of the type currently under development by PARCC and SBAC. Common Core Curricular Innovations – Discover how new Galileo technology can be used to develop and implement Common Core curricula and differentiated instruction. Dialogic technology makes it possible to deliver synchronous and asynchronous instructional communication between a teacher and either an individual student or a group of students. Common Core Psychometric Analysis Innovations – Learn how ATI psychometric research accommodates the introduction of new item types and new scoring paradigms for Common Core assessments. Galileo K-12 Online continues to evolve in response to client needs, changing federal and state requirements, ongoing research in educational assessment and instruction, and advances in technology. A major area of ongoing Galileo innovation is focused on Common Core State Standards (CCSS) and on supporting CCSS implementation. Attend the Galileo Innovations for Common Core Implementation webinar and learn how the current and upcoming innovations in Galileo K-12 Online are designed to facilitate local assessment and curriculum implementation of CCSS in districts and charters. With the advent of mobile computing in the classroom, ATI’s list of supported mobile devices has expanded. The new system requirements, located here for K-12 and here for Pre-K, provide a list of Galileo features that are supported on low-cost devices built on operating systems including Google Android, Apple iOS, Google Chrome, and Microsoft Windows. Every state is required to have a list of standards students at each grade level need to master. It is the district’s responsibility to make sure that every child masters these standards by the end of the school year. In order to ensure this goal is achieved, many districts provide pacing guides to teachers in order to keep both teachers and students on pace to master all standards by the end of the year. These pacing guides identify which standards are supposed to be taught at what point during the year. The benchmark assessments are then created based on the district pacing guide. The answer to this question depends on the district’s method for grading students. The easiest and most straightforward method is a standards-based grading system. This method of grading provides information as to whether a student has mastered a standard or skill or where he or she is at in developing the skill. Information on standards mastery can be obtained using the Galileo® K-12 Online Intervention Report. Using benchmark assessments for a more traditional method for grading, (e.g., providing a letter grade for students based on percentages) may need more thought. In order to provide accurate ability estimates for students at all ranges of ability, it is important that there is a range of difficulties on the items and that even the student at the highest academic levels needs to be challenged. As a result, sometimes the raw scores do not represent the level of growth and success students have actually demonstrated. One example is an assessment where the average raw score percentage was 46 percent, yet students demonstrated an average growth of 20 points on their Developmental Level scores (DL). 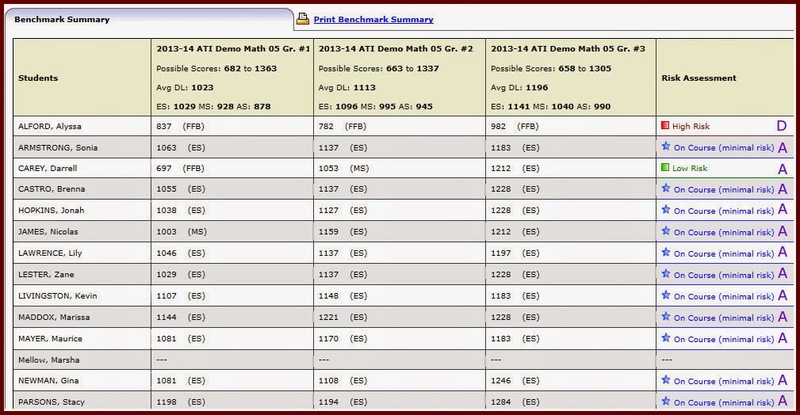 Teachers and districts can use Galileo’s benchmark data when assigning traditional grades. 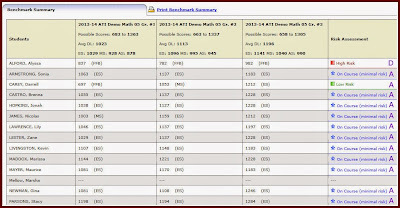 One suggestion to assign grades is to generate a classroom Benchmark Results report. The report provides information for each student’s risk assessment. By providing a grade (e.g., A for On Course, B for Low Risk, C for Moderate Risk, and D or F for High Risk), valid and reliable student data may be converted into a traditional grading system. You may have noticed a few changes to ATI’s home page. These updates are to make the things you need most, easily accessible. But don’t worry – everything that once lived on the home page is still available. The K-12 Spotlight and Pre-K Spotlight are just a click away - now found on the K-12 and Pre-K landing pages, and the ATI Education Newsfeed is available on the ATI News page. Quick links to the ATI Townhall Blog and Galileo Overview registration are still found at the top of the webpage, but with a new design. You’ll also find ATI’s new Facebook page and ATI YouTube channel quick links there. Check them out and be sure to “like” us on Facebook! A primary expectation of the Common Core State Standards (CCSS) for English Language Arts is for students to be comfortable analyzing complex texts. CCSS defines text complexity in both quantitative (e.g., Flesch-Kincaid and Lexile® measures) and qualitative (e.g., sophistication of ideas, assumption of prior knowledge) terms. The standards documents offer a guide for evaluating text rigor and complexity as well as lists of sample texts that meet the requirements (http://www.corestandards.org/ELA-Literacy). Embedded in the CCSS are requirements for types of texts as well, including “multiple accounts of the same event,” “modern works of fiction,” “seminal U.S. texts,” and “foundational works of American literature.” ATI’s ELA writers have expanded our text offerings to support assessment of the new standards. In elementary school, we have added challenging nonfiction texts with higher Flesch-Kincaid and Lexile® measures, such as “The Ice Woman: Louise Boyd’s Arctic Adventures,” and “Up, Up, and Away: The Story of Helium.” Our new texts include newspaper articles, letters, and first-person accounts of festivals, neighborhood gardens, and carnivals. We’ve written contrasting biographies of famous and important writers. To our rich set of folktales and cultural myths, we’ve added contemporary fiction featuring modern-day children with contemporary concerns, as well as excerpts from classic children’s books like The Secret Garden and Little Women. High school CCSS emphasize classic American literature and historical documents. We’ve recently added poems by Emily Dickinson, as well as several short stories by Kate Chopin. Our banks now include presidential speeches, including inaugural addresses by FDR, Lincoln, and Washington, as well as excerpts from The Federalist Papers and Common Sense. Whether you need a benchmark or a computerized adaptive test, Galileo® K-12 Online has you covered with its full range of assessment options. 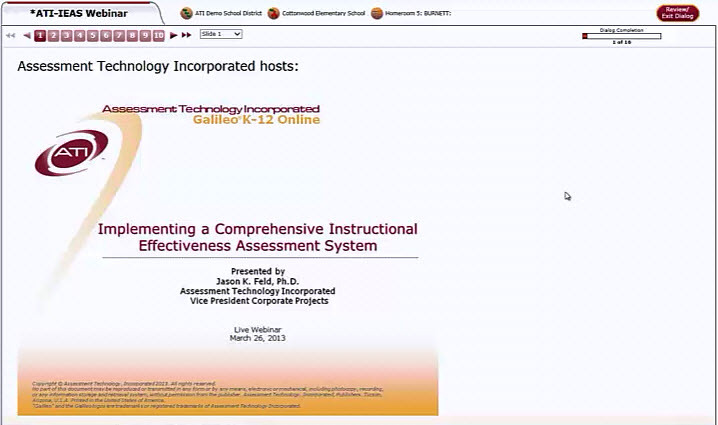 As an all-in-one instructional improvement and instructional effectiveness system, Galileo offers a comprehensive assessment system including not only benchmark and computer adaptive tests but also formative, screening and placement tests, plus interim and final course examinations, pretests and posttests, early literacy benchmarks, and instruments documenting instructional effectiveness. Additionally, ATI item banks are aligned with both Common Core and state standards and now contain selected-response, constructed-response, and technology-enhanced item types reflective of planned consortium assessment approaches. 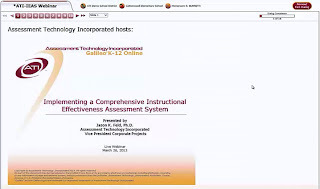 If you missed the ATI and eInstruction June 18 webinar, Bridging student learning, assessment, instruction, and reporting - don’t worry. The webinar was recorded and is available at the following link. The webinar recording illustrates how the integration of Galileo K-12 Online and Insight 360 can help school districts and educators implement a seamless and flexible approach to assessing student learning and providing differentiated, interactive instruction aimed at increasing student achievement and mastery of standards. Educators can easily develop and integrate locally designed instructional improvement and instructional effectiveness initiatives within one complete system. The integration also allows for evaluating student performance quickly and effectively in real-time and over a period of weeks or months with longitudinal reporting and analysis. Users further benefit from the ATI and eInstruction integration because teachers are afforded an at-your-fingertips approach to assessment, instruction, and reporting from a number of mobile and web-enabled devices. Galileo K-12 Online is a Common Core State Standards aligned and research-supported system that includes a completely integrated array of customizable and comprehensive benchmark, formative, computer adaptive, pre-post, and end-of-course assessment tools. Also included are interactive web-based Instructional Dialogs and dialogic curriculum technology for use across any subject area. Real-time Dashboard reporting tools are also included and provide actionable data to all stakeholders to inform educational decision-making. ATI K-12 item banks currently contain over 120,000 items aligned to Common Core State Standards. ATI item banks cover content areas ranging from math (including trigonometry), reading/English language arts, science (including biology and chemistry), and writing to art, music, foreign language, and career and technical education, to name a few. 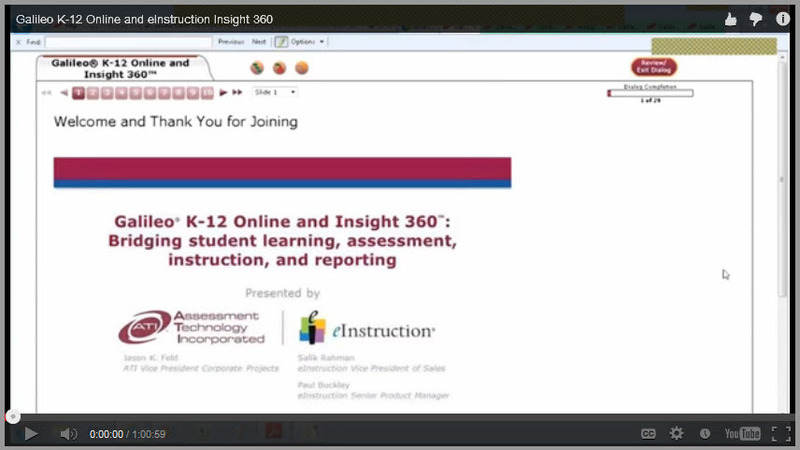 Insight 360 is an all-in-one classroom instruction system that facilitates and simplifies instructional content planning and delivery and real-time assessment. The powerful, easy-to-use software enables educators to boost student engagement and gain immediate results on comprehension through formative and summative assessment using a variety of mobile devices such as eInstruction student response pads (clickers), smartphones, tablets, and the iPad®. This integration makes it possible to use assessment information to guide classroom instruction, enrichment, intervention, and professional development in alignment with the goals of Common Core State Standards and educator effectiveness initiatives. Check out other events, seminars, and webinars on the ATI Events page by clicking here. Contact your ATI Field Services Coordinator at 877.442.5453 for more information. If you were unable to attend the Galileo Pre-K Online webinar on June 11, Galileo Pre-K Online Innovations Supporting School Readiness in Head Start, you can watch it now via the following link. The webinar illustrated the new, innovative, and research-based tools in Galileo Pre-K Online that can assist educators in meeting Head Start Program Performance Standards and the Head Start Child Development and Early Learning Framework requirements for establishing school readiness goals and implementing plans to support the success of programs, children, and families in achieving those goals. Head Start defines school readiness as children possessing the skills, knowledge, and attitudes necessary for success in school and for later learning and life. The Head Start approach to school readiness is designed to ensure that children are ready for school, families are ready to support their children's learning, and schools are ready for children. ATI and eInstruction have teamed up to offer an innovative, technologically advanced partnership that transforms the classroom into a dynamic, 21st century learning environment. This solution builds on the combined strengths of Galileo K-12 Online and Insight 360 in ways that further empower teachers as educators and students as learners with quick and easy access to actionable data, powerful reporting, and innovative instruction. Head Start defines school readiness as children possessing the skills, knowledge, and attitudes necessary for success in school and for later learning and life. The Head Start approach to school readiness is designed to ensure that children are ready for school, families are ready to support their children's learning, and schools are ready for children. This complimentary webinar, hosted by Assessment Technology Incorporated, will illustrate new, innovative and research-based tools in Galileo Pre-K Online. These advances are designed to support the efforts of Head Start educators to meet Head Start Program Performance Standards and the Head Start Child Development and Early Learning Framework requirements for establishing school readiness goals and implementing plans to support the success of programs, children and families in achieving those goals. For more information, click to view Galileo Pre-K Online website. Mathematical understanding and procedural skill are equally important, and both are assessable using mathematical tasks of sufficient richness. One hallmark of mathematical understanding is the ability to justify, in a way appropriate to the student’s mathematical maturity, why a particular mathematical statement is true or where a mathematical rule comes from. Although the new emphasis on understanding is evident throughout the Common Core standards, in some cases it is particularly prominent. We find good examples in two related high school geometry standards G-GMD.1 and G-GMD.2. These standards direct students to an understanding of the volume formulas that they have learned to recite, write, and apply. Mastery of these standards requires students to be familiar with Cavalieri's principle. Mathematicians have used Cavalieri’s principle (not necessarily under this name) for thousands of years. It finds its way to school as an essential element of high school geometry only now. ATI believes that Instructional Dialogs can aid both students and teachers (and even parents) in working with Cavalieri’s Principle. To this end, we have developed two dialogs devoted to this fundamental concept. One is a teacher version, which contains supplemental notes and insights to prepare teachers for content delivery. The other is a teacher-student version, containing the same instructional content but designed for use with groups of (or individual) students. These dialogs were carefully crafted to build upon geometric concepts students are already expected to understand, and the questions posed are articulated to assess understanding of Cavalieri’s principle as well as the ability to apply it. These published dialogs are introductory in nature. In the near future, ATI plans to publish related dialogs to address the role of Cavalieri’s principle in explaining or proving volume formulas. We are pleased to present these tools, and trust they will prove useful in teaching a potentially-challenging topic.